Army 1st Lieutenant Paul M. DeMeo - Run for the Fallen New Hampshire, Inc.
23, of Derry, NH; died of natural causes at Womack Army Medical Center at Fort Bragg. Paul was born at U.S. Army Kwajalein Atoll in the Marshall Islands. He was a 2007 graduate of Pinkerton High School and a 2011 graduate of West Point, where he received a Bachelor of Science degree in Engineering Management. He joined the 2nd Battalion/505th in August 2012. Paul is remembered by his parents, Paul and Lucienne DeMeo, as being "a prince who God called back to His kingdom. “Paul was a charming person who always looked out for his brothers and sisters," his mother Lucienne said. "As an Army officer, Paul looked out for his troops as if they were family." "He was humble and always driven to do better," she said. "He had the most beautiful smile." Paul played flute and piano. He joined the Kwajalein swim team at age 4 and held pool records at Kwajalein. In high school, he participated in several national young leaders conferences. He was an active member of the Kwajalein Tennis Club and by the age of 8 was playing in tournaments including being on the youth team that played the Micronesian Cup at the U.S. Embassy Tennis Courts in Majuro, the capital of the RMI. His performance was good enough that representatives of the RMI government asked him to play for the RMI in the Olympics. He declined feeling that he was too young and didn't think he was in the same class as the older people he would be competing against. In a tournament on Kwajalein he played to a tie breaker that seemed like it would go on forever forcing the seasoned adults to pull out rule books trying to figure out how a tie breaker was supposed to be played since no one had ever seen one. After the tie breaker several of the better adult players started asking Paul to play with them. One summer while at West Point, Paul was sent to England to participate in the final field exercises for the graduating class of The Royal Military Academy Sandhurst. He also participated in the Sandhurst competition at West Point every year while he was at West Point. During the force on force phase his Plebe year, members of the "bad guys" said Paul was considered the key person on his team to be taken down. They didn't get him. Paul decided to join the military while he was still living on Kwajalein, his parents said. "Being born on and living on a military installation in a foreign country until he was 13, the military was the lifestyle he knew," his father Paul said. Within a few months of moving to Derry, Paul joined the Air Force Junior ROTC at Pinkerton Academy. With the help of the AFJROTC led by Lt. Col. Howie Steadman, he became more aware of the duties and responsibilities that go along with different military ranks. "He got a small taste of what it meant to be an enlisted person and found that he wanted to take on the added challenges required of an officer," his father Paul said. He was a member of the AFJROTC drill team, the cadet commander during his senior year at Pinkerton, and received many local and national AFJROTC awards. "Paul was the first cadet from the JROTC program to graduate from a service academy," said Lt. Col. Howie Steadman, one of the program's instructors. "Unfortunately, he was also the first cadet from the program to die while on active duty." "Paul came to us as a young man in the fall of 2004 as a freshman and first year cadet in the JROTC program and he graduated from the program in 2007," said Steadman. "Over the four years, it was pretty easy to recognize how sharp he was and that he was a leader." Paul quickly progressed through the ranks and was eventually selected by the instructors as the Cadet Commander. “That is the highest rank in the cadets," said Steadman. "At the time, there were 200 cadets, so he was at the top of those 200 within the program." Paul would quickly and easily tackle any task, according to Steadman. “He was loyal and respectful and all of those other good adjectives that you could think of," he said. Paul’s two younger twin brothers, Pascel and Nathen kept up the family's tradition of military service; both entered service academies after graduating from Pinkerton Academy. 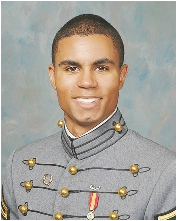 Nathen graduated from West Point this year (2013). "Unfortunately, Paul was supposed to pin his rank on him, but that isn't going happen now. ", Steadman said. Pascel entered the U.S. Naval Academy, and is also scheduled to graduate this May. Steadman said the DeMeo’s parents, Paul and Lucienne, have been ardent supporters of the JROTC program. Over the years, Steadman has had a close relationship with all the members of the DeMeo family; he played a role in Paul's graduation from West Point in 2011. "I went to his graduation to pin his lieutenant rank on one shoulder while his parents pinned the other shoulder," said Steadman. Steadman said the JROTC program will take steps to memorialize DeMeo's life and service next year. "Paul had such a bright future; he had the potential to be a general," Steadman said. "In reality, that can't happen, but in my mind, he will be a general." Paul joined the 2nd Battlion/505th Infrantry in August 2012. Paul was a 2012 graduate of the Infantry Officer Leadership Basic Course, U.S. Army Ranger School and U.S. Army Airborne School. In his current assignment as a rifle platoon leader, he was responsible for leading an airborne infantry platoon capable of deploying in 18 hours to fight and win against a determined enemy. He was responsible for the health, welfare and performance of 38 paratroopers; as well as the care and accountability of more than $500,000 worth of unit equipment. Among his near-term goals, Paul wanted to earn the Expert Infantry Badge, graduate from the U.S. Army Jumpmaster School, successfully complete his duties as a platoon leader and earn assignment to the 75th Ranger Regiment. He was also planning to attend graduate school. He was the oldest of four siblings. His twin brothers, Nathen and Pascal DeMeo, graduate this year from West Point and the U.S. Naval Academy, respectively. His sister Lee is a senior pre-med student at Syracuse University. His awards and decorations include the Army Commendation Medal, the National Defense Service Medal, the Global War on Terrorism Service Medal, the Army Service Ribbon, the Air Assault Badge, the Parachutist Badge, and the Ranger Tab. Paul is survived by his parents Paul and Lucienne DeMeo; his twin brothers, Nathen A. DeMeo, and Pascal J. DeMeo; his sister, Danya Aleesa DeMeo; his girlfriend, Hannah Farmer of Charlotte, NC; his paternal grandfather, Paul J. DeMeo; his maternal grandmother, Amonia Valbrun, as well as many extended family.